TRUMP Reality Check by Q²: Everyone needs to read this! President Trump was manipulated by the Very Deep State into becoming a war criminal. What’s really going on with the POTUS? This submission by Q² is in no way connected to Q Anon or his other LARP incarnations. No one person could ever take on Deep State. Didn’t mom and dad always say “You can’t fight city hall”. Where they really got him is when they coerced him to break his campaign promises. No other POTUS in US history ever won an election based on a promise for peace. There were many other promises made during the campaign season that sold the patriots. But the promise to bring peace and harmony was the real hook. However, the globalists have cynically created more conflict for Trump. The never-ending wars only eat away at Trump’s base. He is now considered by many to be a war president like his predecessors. Deep State can do this to anybody. The Military-Industrial Complex is vast and powerful. So is the international network of globalist organizations like CFR, Trilateral, Bilderberg. The New World Order cabal owns and operates everywhere. The communist Left controlled the levers of US government for 8 years under Obama. That liberal side of the Deep State power base is entrenched and not going anywhere. Trump can’t even get rid of agents of Deep State like the DOJ’s Rod Rosenstein. Or Special Counsel Robert Mueller. Or Attorney General Jeff Sessions. Or FBI Director Christopher Wray. And others who he himself appointed. Trump was a businessman; not a politician. He has no idea what he’s really dealing with “inside the Beltway”. The 2018 midterms will bring a crushing defeat to the Trump administration. The Left is organizing like mad to make sure they win and/or steal every election in sight. Soros, Obama, Clinton et al. know that they only need to flip the House and the Senate. Doing so allows them to impeach Trump. Flipping governorships and statehouses will also provide needed political support. There’s an all-out effort by the DEMs — RIGHT NOW — to capture every seat they can. The anti-Trump sentiments are growing by the day…and will only intensify. The Spending Bill was a HUGE political disaster for Trump. He lost many fiscal conservatives right there. They’re all gone—with his own signature. The National Debt has also ballooned under Trump. It’s now well over $21,000,000,000,000! US Govt will borrow over $1 trillion in 2018. Trillion Budget Deficits are returning according to the CBO. Trade Deficits are also hitting a 10 year monthly high. The ‘successful’ Tax Bill was mainly a giveaway to the corporations. The rich and powerful will only get richer from that Democrat-approved legislation. Obamacare has not been repealed even with Republican majorities in both chambers. The Border Wall remains as elusive today as it was when Trump first promised it. The Democrats will simply not allow a wall, and they certainly won’t allocate funds. The DACA debate remains just that—a debate. There’s been no real movement. The Liberals are far too organized to permit any meaningful alteration to Obama’s DACA policies. As for federal Immigration Policy, every Trump executive order has been thwarted. He knows the liberal courts will overturn every EO, especially the immigration orders. Even those orders that go unchallenged, they will not be enforced. Next, there is President Trump’s Gun Control, and the right to bear arms. Yes, he’s already foisting his own version on the nation. Trump has directed AG Sessions to craft a new federal policy that is restrictive. The right to purchase bump stocks is on the table. So is the age allowed to buy assault weapons. So are other serious gun control measures that have not yet been put out by the POTUS. They’re coming… and there’s no stopping it except for the patriots to…. If there is one major area where Trump is extremely weak in, it’s his foreign policy. His Mideast policies are a total disaster. An unmitigated disaster! Moving the embassy to Jerusalem fulfilled a promise to Israel. His roller coaster ride with Russia inspires NO confidence. Neither does his love-hate relationship with China. Nor did his theatrics regarding North Korea’s rocket man. Kicking off global trade wars doesn’t help either. Particularly by pursuing a perpetual war foreign policy like past presidents. This has become his Achilles’ heel. It was his weakness all along because of his own streak of American exceptionalism. So the globalists will use it to turn his base against him, which they are doing. Once Trump starts his first major war, he’s toast. He already attacked Syria a year ago. He has permitted Saudi Arabia to destroy Yemen—a very bad situation! As he has approved Israeli attacks on Syria this April. He always allows Israel to destroy the Palestinians. He has also supported the fascist neo-Nazis in Ukraine against Russia. Trump’s foreign policies have the potential to blow up the Middle East. As well as trigger the hot phase of World War 3. Each of these dismal failures has its roots in the RINO leadership. But especially the Neocon Zionist cabal that took over the West Wing. The foreign policy fiascos are driven by this cabal in collusion with the MIC. Hence, much of the blame falls on the POTUS. Trump could never do this alone. He knew that. He should have known that before he ran. And yet he’s fired some of the best people to advance his agenda. Most of those who now surround him are a part of the problem. And there are very few left who could be a part of the direly needed solution. Trump sabotaged his own agenda through many key appointments. Being a top-down management-style CEO, he calls the shots. Which is good when you know what you’re doing. And you surround yourself with competent managers and staff. But there’s NO ONE he can trust to implement his promised domestic plans. Or his promised foreign policies of no more war. And peace with Russia. What we are witnessing is an unparalleled crisis in presidential leadership. If there’s an upside it’s that Trump uses the chaos and confusion to expose Deep State. To expose the seditious Mainstream Media. To expose the treasonous FBI. And to expose the traitors at the CIA. This is the best that the Patriot Movement can hope for right now. This is actually his primary task. He’s the ultimate change agent. He’s still a massive wrecking ball! Which is exactly what Deep State needs right now—a controlled demolition. However, something very BIG must happen between now and the midterms…. This is the critical time period. The window of opportunity will shut on January 3, 2019. When the 115th U.S. Congress is seated, everything changes. Trump is well aware of the political calculus. Every day that goes by his hand gets weaker. He’s also well aware that there’s a gathering storm. Stormy Daniels is only one example of a superstorm heading toward the White House. When Deep State puts a POTUS in its crosshairs, how can he govern. When even the FBI and CIA tried to prevent his victory, how can he trust them. Now they even raid his personal attorney’s residence and business. That’s after they started a raging fire on the 50th floor of Trump Tower. The mainstream media is relentless in their negative coverage of Trump. The C.I.A. has so many rogue operations against him, you can’t keep them straight. Trump’s real vulnerability, however, lies in his decades of massive exposure. Because of his various high-profile businesses, what might come out is anyone’s guess. The current reality is that Mueller was appointed Special Counsel to look under every rock. Which he will continue to do until they have enough evidence to back-channel to his new personal lawyers. At that point, Trump either resigns, is impeached, or he digs in. If he digs in, he will quite likely “wag the dog”. The truth be told, Trump is wagging the dog in Syria at this very moment. Every single move today on the global geopolitical chessboard is carefully considered. The Powers That Be are on a serious mission. The decisions of the POTUS weigh heavily. However, his foreign policy actions are what really matter from this point forward. Trump has been methodically cornered into making these decisions about war. To say that he can make LOTs of wrong moves is gross understatement. His actions can be catastrophic to the extreme. Even leading to nuclear war. This month (or year) may be the most consequential of the decade. Trump just wagged the dog in Syria. He chose the path of least resistance. Even The Washington Post backed Trump’s decision to attack Syria a second time. Virtually every RINO and Democrat in Congress supported his misguided missile attack on Syria. 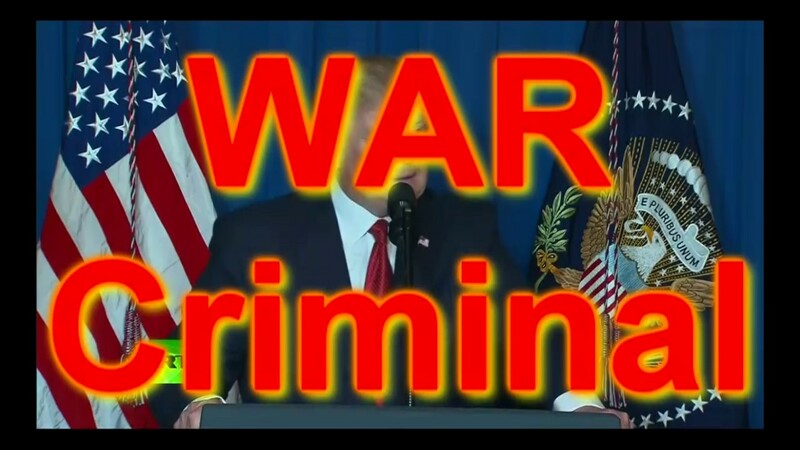 Because of his cataclysmic invasion of a sovereign nation, Trump is now a war criminal. He completely shredded his campaign promises with a second egregious war crime. He will lose his base—BIG time! Every vote for peace in 2016 has been betrayed by this war president. As Commander-in-chief, Trump is directly responsible for the Friday the 13th invasion of Syria. Those who would have voted for him in 2020 for peace will now stay home. While the DEMs will be out in force, unless he’s already impeached. Trump did this to himself. He should have exposed 9/11 as his first order of business. Instead he chose to do business with Saudi Arabia, a major 9/11 co-conspirator. Trump threw major support to the Saudi’s criminal war on Yemen. The ensuing humanitarian crisis is a great stain on his presidency. By getting in bed with war criminal Saudi Crown Prince Mohammad bin Salman, he revealed his true intentions. The false flag chemical attack in Douma was staged by the West. As always, American, British, Israeli and French intelligence agencies and militaries conspired to blame President Bashar al-Assad for the chemical attack hoax. It was a black operation executed to justify an attack on Syria to reverse Assad’s victories. His military advisors knew this. The governments of Great Britain, France and Israel knew this. May, Macron & Trump are Netanyahu’s 3 Stooges! The entire Congress knows that the chemical attack was staged to push Trump into war. The mainstream media knowingly published fake news about Syria. Once again, false reports were cynically used by a POTUS to wage an unprovoked war of naked aggression. Trump knowingly trumpeted fake news about Assad’s Syria, Putin’s Russia and Khamenei’s Iran. His false accusations were used as a pretext to launch another illegal attack on a nation already devastated by a 7 year war. We the People have been seriously deceived. And using U.S. Taxpayer’s money. In order to rain death and destruction on the innocent people of Syria! S A D ! Very sad indeed! Trump is now a stone-cold war criminal! His enemies purposefully morphed him into a war criminal. In this way they will attempt to manipulate him to do even worse things. This final point on Trump’s illicit bombing of Syria is extremely important. Trump was obviously set up to commit this war crime for various reasons. One of those is this: Deep State has now to turned Trump into an international war criminal. And the whole world witnessed the war crime. Trump has joined the club of all the previous POTUS war criminals. He can no longer criticize them like he once did. If Deep State really wants to make his life miserable, they can even threaten prosecution. The purposeful destruction of the false flag chemical attack crime scene is also criminal. In other words, Deep State just backed Trump deeper into a dark corner. There’s all kinds of actionable evidence to prosecute him should Trump refuse to carry out future orders. President Trump needs some serious prayer. So do his closest advisors. So does his entire administration. Pray for the American people, especially for their enlightenment. Pray for a speedy and successful resolution of any conflict leading to war. Pray for the Syrian people. Pray that the highest good will be served for every person on the planet. P R A Y ! ! ! And May God Bless America!